Dahl-Jensen vase - 5½" (139 mm) high. Jens Peter Dahl-Jenson was a Danish designer born in 1874. He was trained as a sculptor at the Copenhagen Academy. In 1897 he started work at Bing and Grøndal, where he stayed for twenty years as a designer and modeller. He then spent a further eight years as artistic director at their Norden factory in Copenhagen. 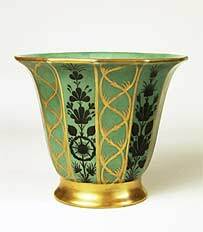 In 1925 he started his own factory in Copenhagen, making the porcelain pieces for which he is best known. The company continued production until 1981 and after selling off all its stock, closed in 1984.